This item will likely bring two different reactions depending on your age. 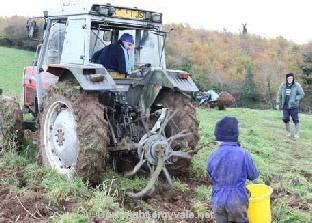 For the older among us we will remember the back breaking work of gathering the spuds - stooped over all day picking the spuds out of the clay, after they had been scatter out by the digger. 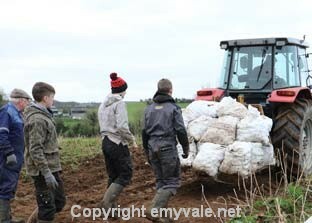 The beauty about it was that most times this work was done during the weekdays in Autumn - October/November - when school was open and no teacher was going to give out to a pupils who had to stay off school in order to help with the spuds. It was even more difficult work if it was done on a Saturday as you missed a free day from school and the pay wasn't great either. At the time it was a great invention when the potato kicker arrived on the scene instead of having to use a spade to dig out the ridge. The owner was in great form getting the work done as in those days a lot depended on a good crop and one that was saved and in the shed or in the pit to save it from the frost. The potato was a standard food for animals and humans and we all know what happened in 1845 + when the crop failed. Some farmers were able to sell off a ton or two in order to get that extra bit of cash for things that were needed or for a special occasion coming up. 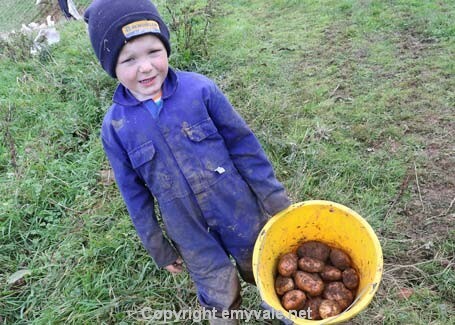 Yes, our age group can remember the satisfaction of getting a good feed of spuds with raw eggs and/or a ludder of home-made butter with cabbage/ turnip or other vegetable. In the winter it was spuds ion a bowl of good vegetable soup and some time every week there was beef or bacon. 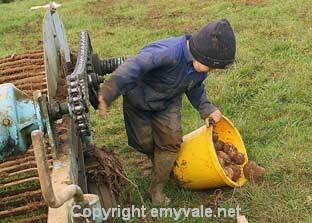 Those were the days and the younger generations will look at the spud in a different way - mainly as a 'chip or wedge! However where they come from and how they get to the cook is not really relevant to the modern person. Some farmer grows them somewhere and we get them in the shop, as clean as can be and all the same size. 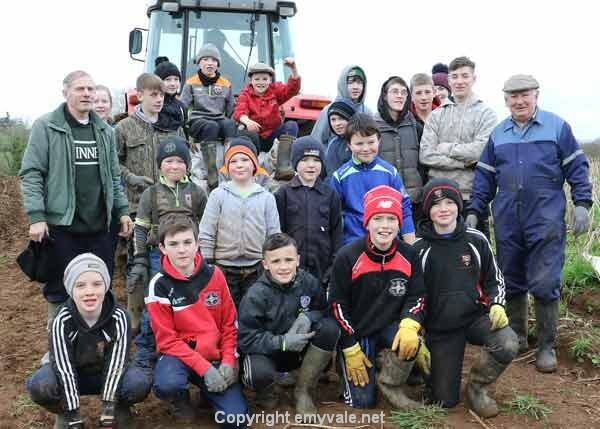 The knowledge of the potato crop was increased for a group of 25+ children who attended spud gathering in a field in Emy on Saturday November 18th 2017. 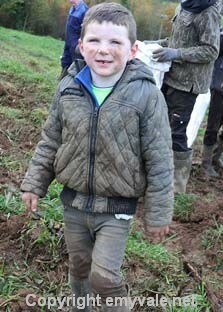 Brian McKenna, Carrickroe, who has land in Emy planted half a field of spuds and they were ready for digging. 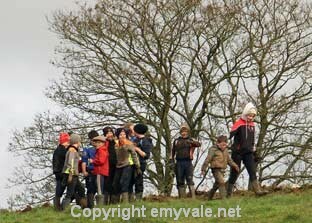 He invited over 25 youngsters to do the gathering and it was a sight to behold as they eagerly got to work. 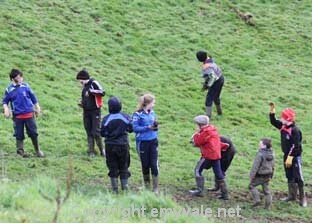 The ground was a little wet in places but the wetter the better and the bags began to fill rapidly. 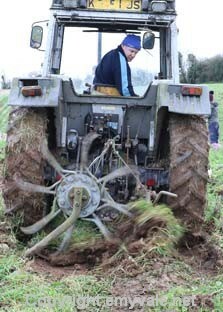 It was a great crop and a great potato but with clay stuck to it. 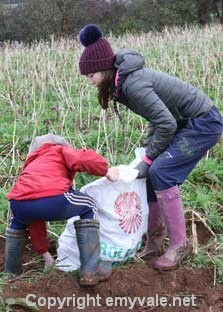 Soon hands, wellies, trousers, jackets, caps, faces, everything was covered in clay but the spuds were gathered. All the while they were learning about the crop, how it got there, what would happen next, how to lift heavy bags safely, how dangerous machinery was and how to stay safe. 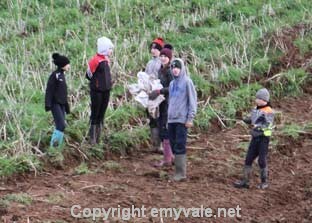 All in all a fantastic educational experience and one they will remember all their lives - the day they gathered Brian McKenna's spuds. Unfortunately the machinery did not work as well as the humans on this occasion as a vintage digger was being used and it soon showed its age by breaking down. A welder was needed but none on hand. 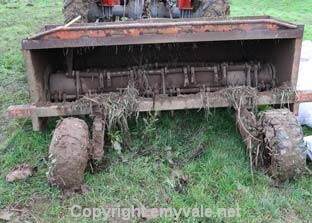 However another different type of digger was available and went to work but alas it too gave up after a drill or two. 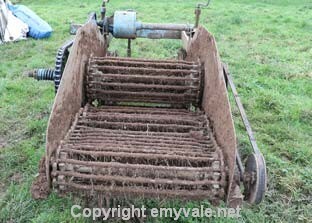 A more modern machine was then introduced but the drive-shaft was different and it took quite a while to find one that fitted. Too soon then the light faded and the day's work came to a close. 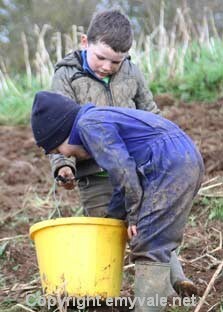 There are still lots of potatoes to be gathered. 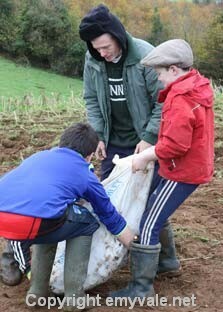 Well done to Brian for the initiative and for bringing a bit of history alive for the young people. Added to that is the amount of physical activity and exercise the young people enjoyed will do their health the world of good. 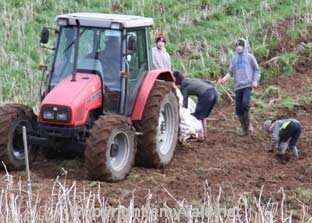 Well done too to the workers for their enthusiasm and willingness to get 'mucked in' to get the job done. Lastly well done to the cook, who, in accordance with tradition, brought the food to the field and let them eat it i the fresh air, where appetites become ravenous, and that they did as the cook was eaten out of everything.